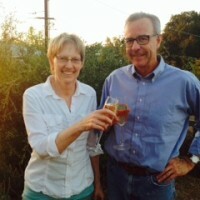 Last month, my husband and I sent off our final college payment. Bruce and I made monthly payments for seven consecutive years for our daughter Caitlin and our son Ben, who will be graduating from college in May. We did not take out any loans to pay for college and neither did our children. 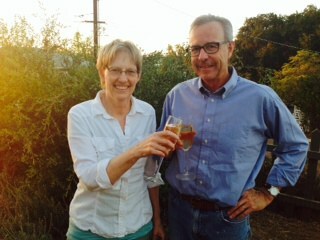 Our daughter Caitlin took the picture of us sipping cheap champagne in our front yard to celebrate this milestone. When your children are little (see mine below), college seems so distant that it’s hard to get motivated to save for this monster expense. When you are in the midst of paying for college, those monthly payments seem like they will never end. As a couple, we resisted the natural urge to put off saving and we are proof that the monthly obligations eventually do disappear. I hesitated to write a blog post about our success because one of the main keys to paying for college is to start early and if you’re reading this blog your children are probably teenagers. I hear from parents (mostly affluent) who bitterly complain about what colleges expect them to pay for college. A family making $150,000 a year, for instance, with one child in college can have an expected family contribution (EFC) that’s in the mid $30,000 range or higher. And most colleges will expect parents to pay more than their official EFC. It would be very hard for most families to pay for college strictly out of their household income, which is why getting a head start is essential. And that’s especially true during an era when the wages of most Americans have shamefully stagnated while college prices continue to rise beyond many households’ ability to pay. 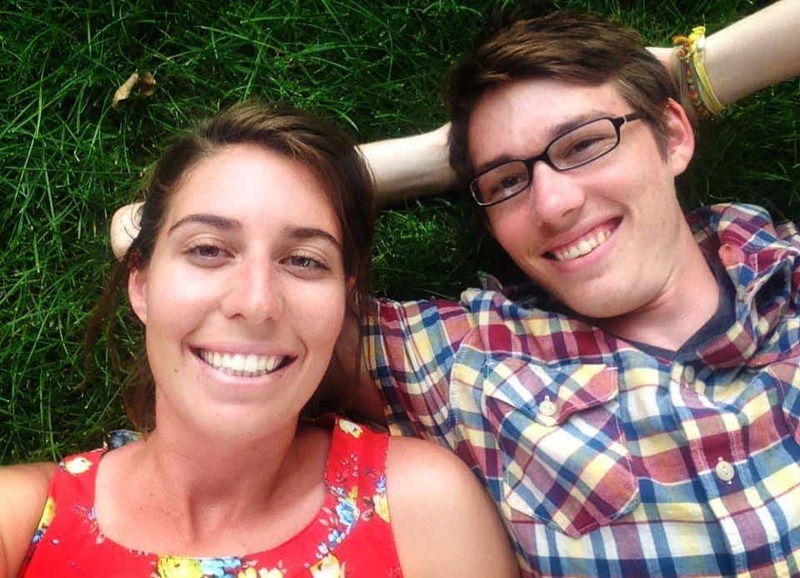 My husband and I started saving for college when our kids were infants. I left the Los Angeles Times when my daughter was just 1 1/2 years old so we could move to San Diego where my husband got a job as a science writer/columnist for the San Diego Tribune (now San Diego U-T). My LA Times reporting position was the last “real” job I ever had. I eventually began freelancing as a personal finance journalist, which allowed me to stay home with my two children. For many years, my income was erratic. 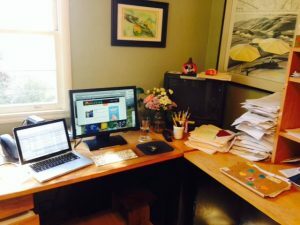 During the dot-com boom years, I got two book contracts to write about investing in one 12-month period, Other years, I struggled to adapt to the reality that the number of financial magazines had shrunk. Through it all, saving for retirement and college were our top priorities. That meant that buying a house in the area known for great public schools (suburban North County) was not in the cards. Before my daughter’s second birthday, I visited the San Diego County Board of Education to look at the academic report cards for grade schools in a less expensive area of the county (La Mesa), which was much more to my liking because the houses were many decades older (not tract homes). My husband (also a journalist) and I tried to find opportunities to save a few dollars more whenever we could. When my kids stopped wearing diapers, we increased our monthly college contributions. When my son was out of preschool, we upped what we could save. Most of the toys, books and clothes that our kids had for many years came from garage sales. 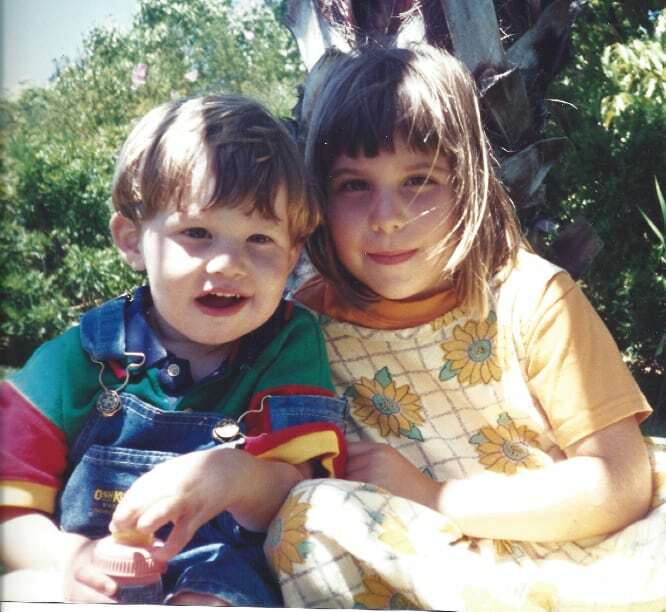 When Ben and Caitlin were older, they knew that we would not be buying them a car (a huge money drain). It would not even have occurred to them to ask. Parents often believe that it’s important for their children to attend the very best schools in the very best neighborhoods and will spend whatever it takes to do so. I have never bought into that belief. And if you’ve spent anytime listening to the Freakonomics guys, you’ll appreciate why this isn’t true. The grade school and middle school in the K-8 district that my children attended in La Mesa did not enjoy the top ratings that North County schools commanded, but they were very good. By being very involved at the grade school and knowing the principal, I made sure that my kids were assigned to the best teacher in every grade, which I think gave them an advantage. By the time my kids finished with the neighborhood schools, they were very well prepared for high school. My son went to a charter high school (High Tech High) and my daughter went to a private, all-girls high school (Academy of Our Lady of Peace). I let my children know that we were saving for college and shared the progress with them. 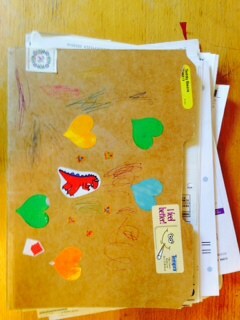 Here is a photo of the college folder that Caitlin decorated that I used to keep track of her college account statements when she was young. (This was before you could go online and get the information easily.) I bought Caitlin a large pink and purple calculator and showed her how she could calculate the value of her college accounts. I also explained to my kids about the power of compounding and the benefits of saving early. With Ben sitting on my lap in front of the computer, we would occasionally use an online calculator to see how much he could accumulate for his retirement if he started saving even modest amounts early. Both my children have Roth IRAs and my daughter Caitlin maxes out hers every year. I expect Ben will do the same when he gets a job. As I said, I realize none of this is going to help people who are facing large bills right now for college, but I think how we invested the money could help you with your retirement goals. Like most financial journalists (at least the ones that I have met in my career), I invest in index funds. I’ve invested in Vanguard’s index funds for many years for our retirement and non-retirement accounts. I also picked two 529 college funds — Utah and Nevada – that use Vanguard Index funds. Utah now also uses index-like funds from Dimensional Fund Advisors, which are excellent and not available to most retail investors. My husband and I also invest in DFA funds. If you are not invested in index funds, you should explore doing so. As an investor, you can’t control what returns you will earn in the future. However, what you can do that is very powerful is to control your expenses. One major reason why financial journalists embrace index funds is their low expenses. Even mutual funds that charge average expenses will greatly erode your returns over your investing lifetime. Investing in index funds over time will generate higher returns than the vast majority of mutual funds. If you’d like to learn more about index-fund investing, I’d suggest reading just about any book that Larry Swedroe, a nationally recognized investment advisor in St. Louis, has written. Also check out the common-sense investing posts that Carl Richards – one of Larry’s colleague — writes for The New York Times. Finally, I wish you all the best in paying for college. I found you by searching on college savings. Our child isn’t born yet! Thanks for the tips about involving the child. Congratulations on doing what many others won’t or can’t do! Great read. Not all of your readers have teenage kids! I have an infant and a toddler and I am so happy to read this blog! It gives me extra encouragement to save for college early. Your story is very inspiring and educational. Thanks Oxa. I am glad you are doing your homework early. I’m glad I could be of some help! Congrats Lynn and Bruce! My husband and I just finished paying our first year of college tuition for our oldest daughter. My husband and I married young and continued to slog through college with two kids (now we have three). Our college savings plan involved three things: Always living on one income so a second adult was ready to jump back into a career and pay for college when the kids graduated from high school, encouraging them to do their best in school for the sake of learning itself (not SAT scores, gpa, or “that will look good on your application”) and finally focusing on the colleges that met 100% financial need and had need blind admissions. And I bought your ebook! I’m happy to report our plan is working. My daughter is finishing her first year at the University of Chicago with a very doable EFC which my daughter contributes to through a summer and school term job. I truly believe that her alternative education filled with internships, jobs and travel allowed for a very creative, unique and sincere application. My current high school junior understands that college is a financial decision as much as anything else and is choosing to defer college for a year to take a gap year. He is planning an Americorp year to earn an education tuition reward to help pay for an expensive NOLS course he hopes to take. He also has his list of 100% need met schools that we are cross-referencing with the “Colleges That Change Lives” list. Also, I agreed to hosting two exchange students for the school year which offsets our tuition payments and allows me to continue being available for my two children still at home. It worked out so great that I am officially a graduate student myself as of last month! Thank you for all your great information and stimulating conversations.You have been a tremendous help and support for me. Congratulations to you and Bruce, Lynn. Well done! Wish like heck my husband and I had been so clear-eyed regarding saving for college and personal finances in general. We lived in a state of denial for a number of years thinking somehow that we could pay as we go. Thanks to scholarship support, our daughter’s good grades, and some outside help, our daughter is starting college at a good four-year public university in the fall. With any luck, she will get her bachelor’s degree with minimal debt and a good college experience. But it all could have been so much easier had we taken the long view years ago. We are making the sacrifices now we should have made long ago. I also like your advice about involving your children early in the process–not only is it excellent role modeling but it keeps YOUR eye on the ball, too. Cannot thank you enough for all you do, and continue to do, in this whole area. Take another bow! Thanks Liz for your kind words! I am wishing your daughter Katie great success at Northern Illinois University. I am sure she will make the most of her experience! Congratulations to you, Bruce and Ben! That is quite an accomplishment and a gift to your son in two ways; no college debt and an excellent example of setting goals, priorities and managing money. Thank you for sharing your knowledge and introducing the world beyond USNWR Top schools! Looking forward to taking your class in the future. (in 4 years from a small liberal arts college), which felt good. Thank you again for the info you provide. Congratulations for finishing those payments for one child! I experienced the same thing. Once we finished paying for our daughter Caitlin, we had three years left for Ben. I bet those next three years fly by. Congratulations and well done! Thank you so much for your great blog. I have learned so much from both your blog and your book. I plan to take your course the next time it is offered. Thanks! And I’m glad you want to take a future course. I will probably have another course in September. I like that you got the kids involved early so finances were no mystery to them, and they learn what’s reasonable and why. It also builds practical knowledge, appreciation and gratitude for what you are building on their behalf. Based on what I learned from your blog, resources you shared, and class at UCSD, I had financial talks with my son on what I could afford to pay and why. He knew well in advance of applying anywhere that if the final cost was too high for any college, he would let it go. When that happened, he did drop a few from consideration. I think it really helps when kids have time to let the cost issues sink in over time. During those heady days in the last semester of high school, it’s easy to get caught up in the temporary excitement. But it’s not exciting when you or your kids are saddled with long-term debt. I completely agree with you that the kids have to have an appreciation of what college costs. You are so right about high school seniors getting so excited about their college choices that they can overlook the financial consequences of their decisions. My son applied exclusively to liberal arts colleges, but I knew that he really wanted to go to Beloit. He didn’t say anything until he got the Beloit acceptance letter and the award letter. He knew he wouldn’t go if the money wasn’t there. We were thrilled that he got to go to his No. 1 choice and he has thrived there. Congatulations. PS- I have 3 boys I am willing to sell to you and Bruce, or to the highest bidder. They only need 10 years of benefactor support. They come complete with public university acceptances (although the youngest is only in 7th grade, I expect him to follow his big brothers into the UC). All kidding aside, It’s not easy to put children through college these days. If we just take a look at the tuition from the late 70’s at the University of California, it was no more than $1,000/yr. A family making $25,000 per year (25x), yes, struggled but could still pay for college. If you used a lower multiple of 20x for tuition alone, then with tuition at UC at 14,000 this year, they would have to earn $280,000. And going to a private university is even more demanding on savings and salary. I tip my hat off to anybody who is able to be fortunate enough to save, own a house, and survive the media business. You and Bruce did both. Spend the extra savings on a cruise or two! I do think that the escalating price of college is a national scandal and the higher-ed industry – and it is an industry — is going to experience tremendous upheaval someday. It’s not there yet though. It will happen at the time the “Echo Boomers” bell curve moves to fewer students. My bet is somewhere in 10 years. If they don’t have the total population of new students, the private colleges, such as in the midwest, will have declining enrollments in their states and will need to fill the seats and will try to go outside to the high population, impacted states. Gonna be interesting! Wish I had the stats. Thanks for sharing your approaches for saving and paying for your children’s educations, Lynn, and congratulations! We are just about to begin college payments in a few months, and if all goes well we will have sent our two girls through college by 2023! It has been HIGHLY beneficial to get some perspective through reading your blog over the past several years as our older daughter has gone through high school. Please keep your interesting topics and commentary coming. I wish you all the best as you begin paying for college for your two daughters. You just have to keep telling yourself that the prize is worth the sacrifice. And thank you so much for visiting my college blog over the years. It’s a treat to hear from people who I have helped in some small way! we too celebrated with a nice dinner and bubbly when we made our daughter’s last payment–also 7 years, our son BU 2004, our daughter U Richmond 2007; altho they did take some federal loans, both have finished repaying them and we took no loans. We are proud of how we managed, and I frequently preach the joys of beans cuisine to my college advising clients now….! Congrats; it is an accomplishment to take real pride in, al the while reserving the lion’s share of pride in your offspring. Congratulations to you too! And thanks for the kind words.